The embers still burned in the ruins of the once great Edinspire. The city was in ruins, its local populace beginning the impossible task of rebuilding and reclaiming their dead. 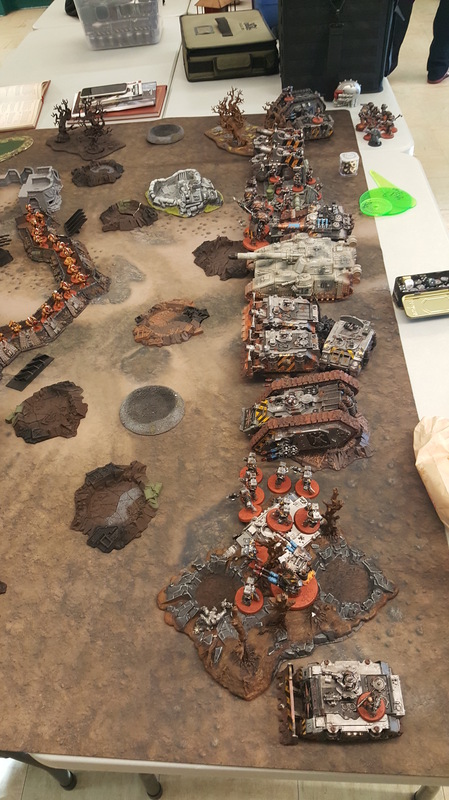 Burnt out wrecks of astartes vehicles were everywhere, embedded into bunkers and in the middle of streets. You could no longer tell to which great legion they belonged. 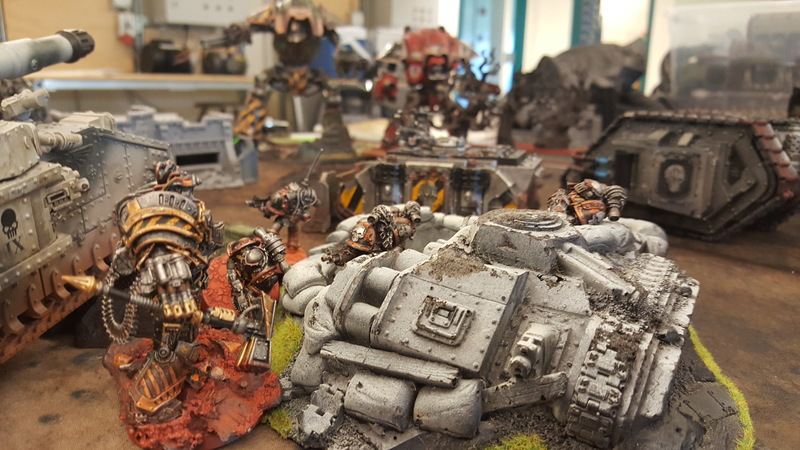 The Iron Warriors had failed. 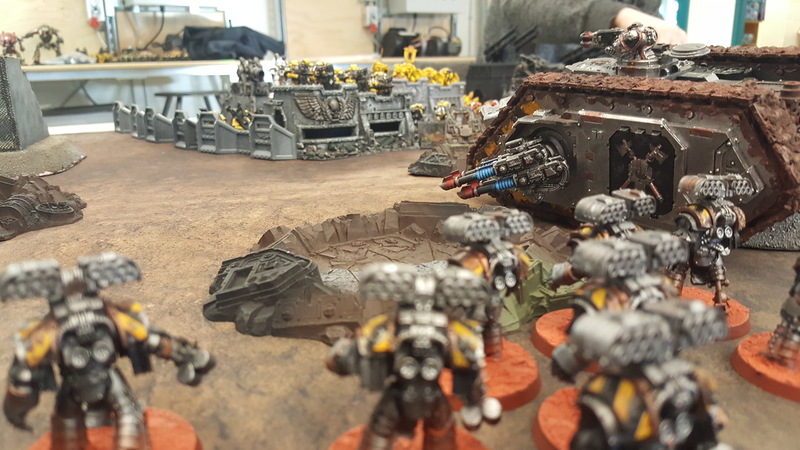 In a final attempt to crush the last of the Imperial Fist’s they were driven back and their forces decimated. 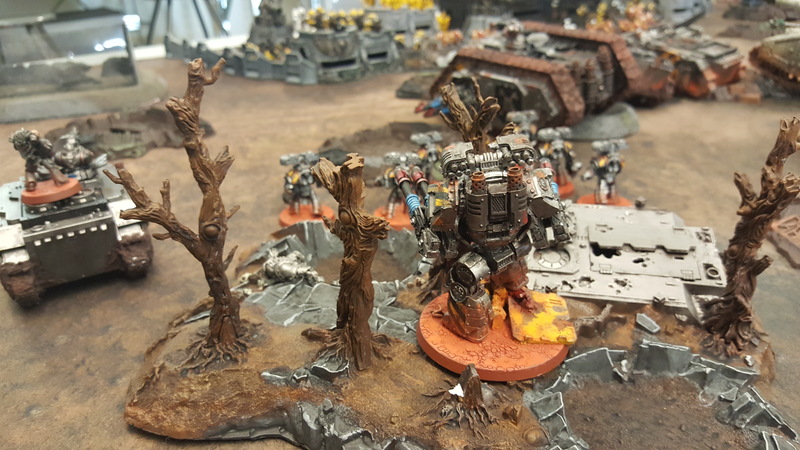 The stalwart defenders still scoured the ruins looking for any surviving Iron Warriors and finishing off any that still drew breathe. Rogal Dorn himself had led the defense and was still hunting for his brother, Perturabo. 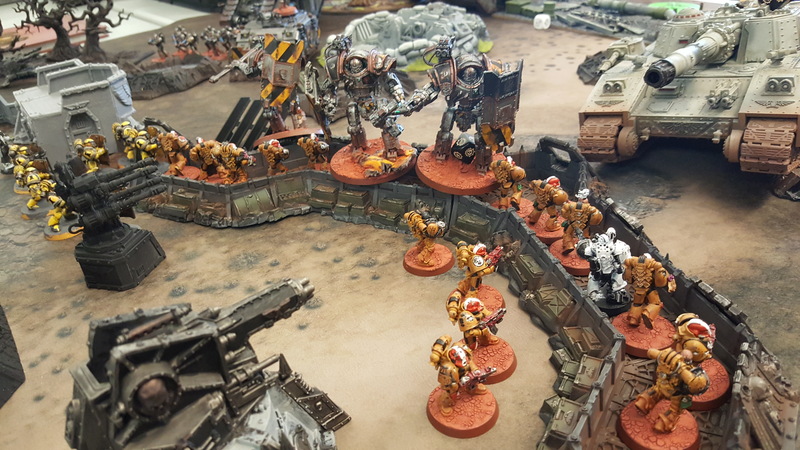 Dorn knew his brother had led the attack, riding straight up the middle in his personal command tank, The Tormentor. 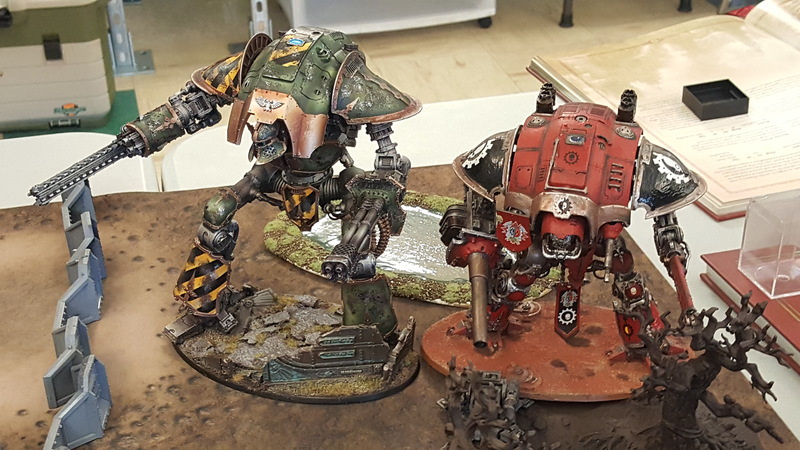 The last reported sightings saw Perturabo alone in combat with two knight titans, felling one of the great machines but then disappearing soon after. 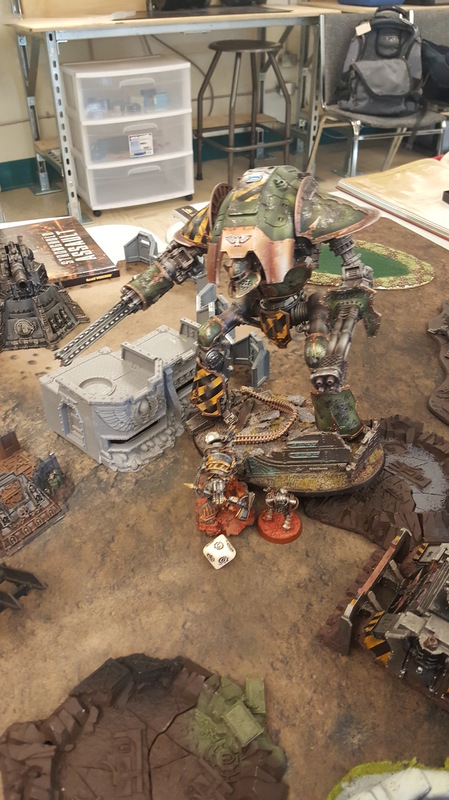 Rumors of Perturabo’s death held no merit to Dorn. He would know if his brother had fallen, and he would make sure when he did die it would be at his hand. But he had to be sure Perturabo was gone and would tear the ruins apart in his search to confirm it. On his flagship, Perturabo had not been seen for a week since returning to the ship. He had gone straight to his own chambers after giving the order to break system, leaving any survivors on the surface without an attempt at rescue. Only 1 legionary had tried to rouse the primarch, Captain Grulnor of the 25th company, who himself was badly wounded on the surface. He was not seen again after entering. 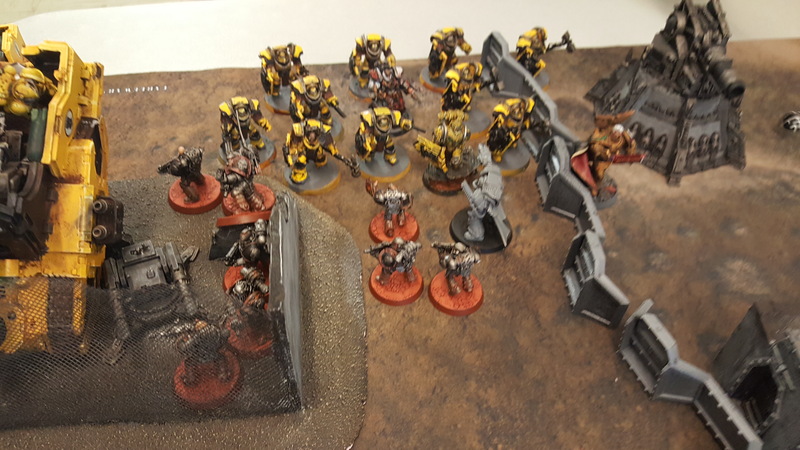 The Iron Warriors fleet quietly translated out of system, the legion left to rebuild and repair themselves for whatever their primarch might throw them into next. 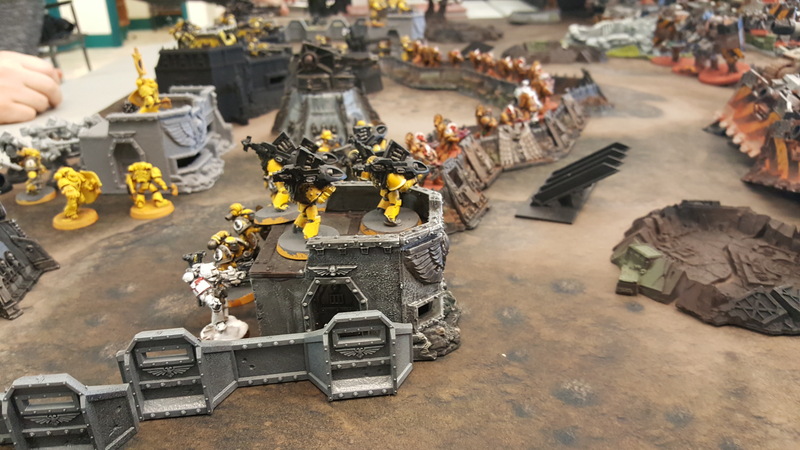 The mission saw the Imperial fists on their board edge focused in the center manning the walls. Half of their army was in reserves. 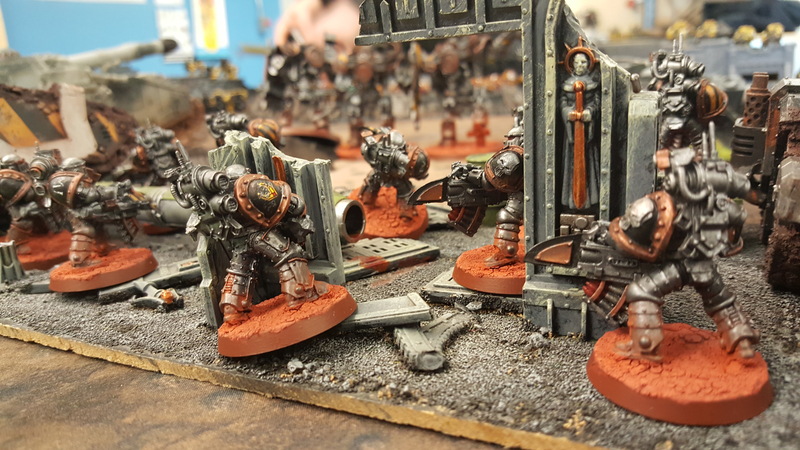 The Iron Warriors were spread from edge to edge on the opposite side ready to jump into the enemy lines. Attackers: d3 victory points for each unit wiped out that is on the table from deployment. 1 VP for each unit totally destroyed otherwise. 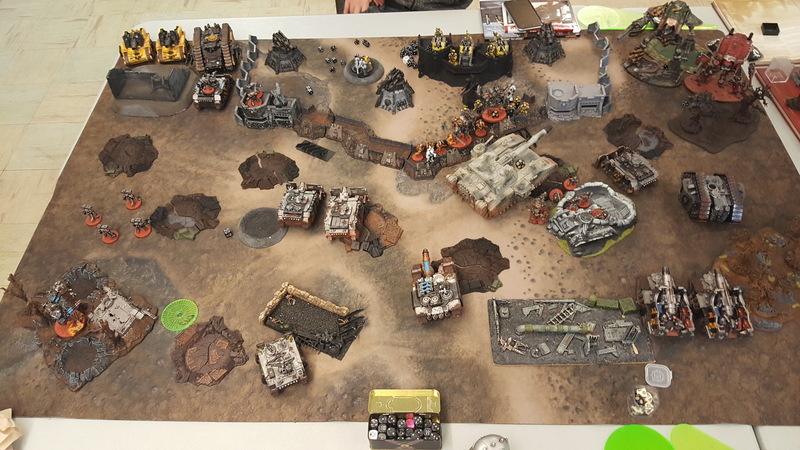 1 VP per bunker and gun destroyed (4 bunkers, 3 guns). Defenders: 1 VP for every unit still surviving, 1 VP for every enemy unit destroyed. Both: First Blood, Linebreaker, Slay the Warlord, Price of Failure. 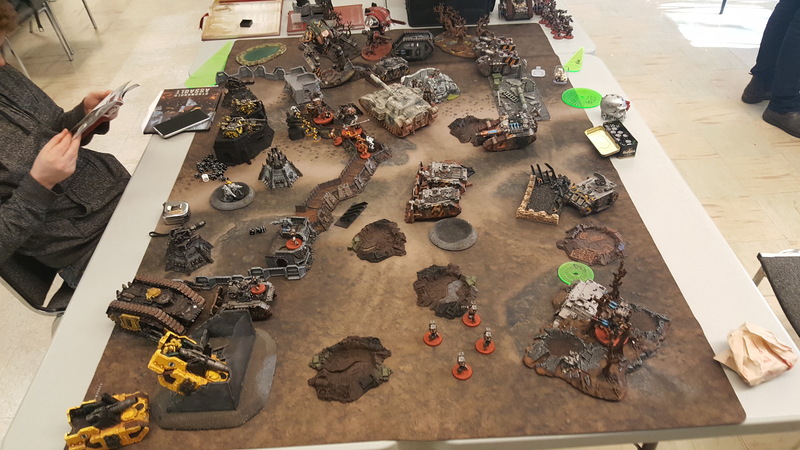 The Iron Warriors got first turn, and the goal here would be to kill as many things as I could and as quickly as I could! Everything that could advanced straight forward up the table hoping to reach the enemy lines quickly. In the opening volleys the central bunker was destroyed as well as the bunkers on both far flanks. The fists took some casualties from this but not too many. In what looks like a bit of a light turn of shooting did grab me 3 victory points at least. But was hoping for a larger swathe of destruction. 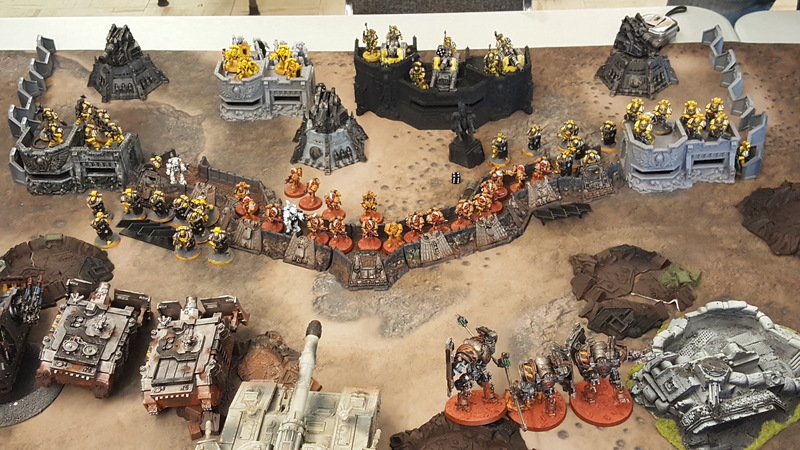 The Imperial fists on the left flank led by a brave breacher sgt, sallied out of their lines and straight into my Spartan. 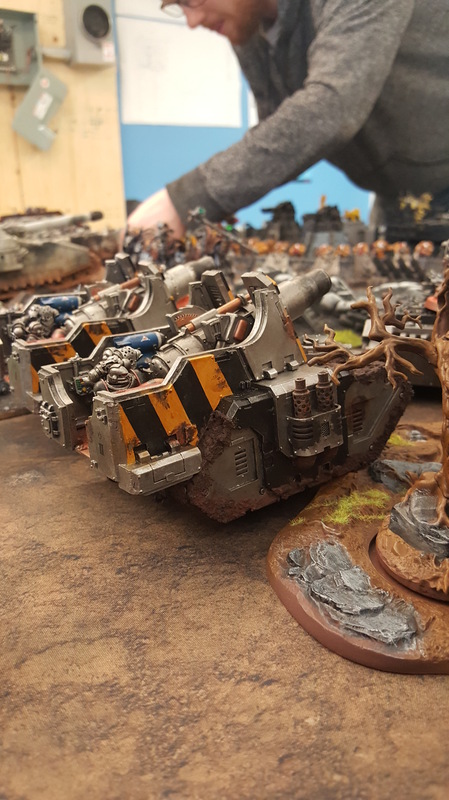 Strapping as many metla bombs as possible to the hull turned it into a slag heap. Return fire from the automated guns, for the first time in 3 games, actually managed to put in some work! They killed 1 medusa and stunned its sister. 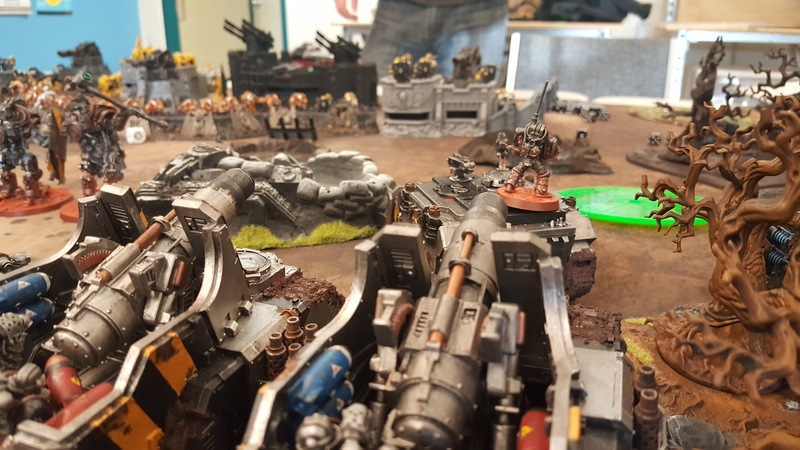 The grav team was able to knock a few hull points off the spartan before the breachers hit it, and also took out one of the vindicators. The automated guns also managed to wipe out most of my usually very survivable Iron Havocs. 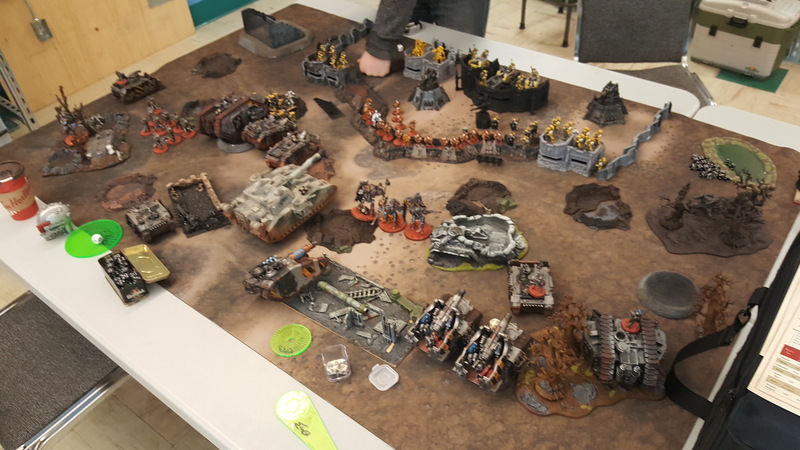 Turn 2 began with the Iron Warriors pushing further up and continuing to shell the last bunker, which ended up causing a massive explosion, decimating the squad inside. The rest of the artillery continued pounding the scattered infantry to try and soften them up and lessen the return fire. 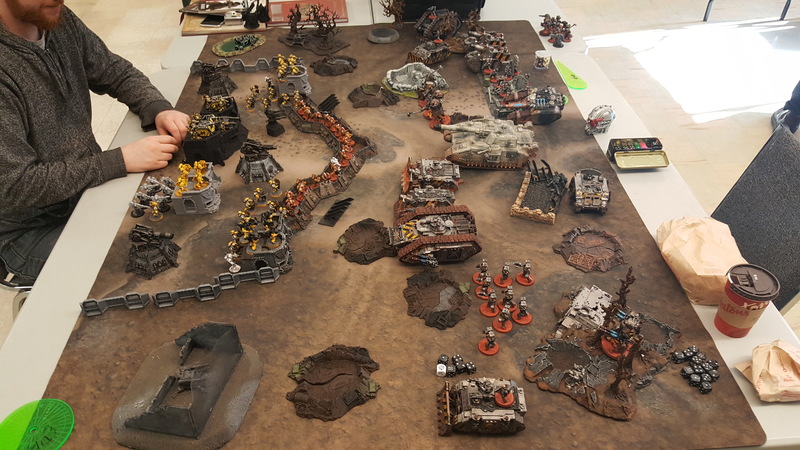 the Iron Circle charged right into the middle of the central tactical squad but, due to their rules of getting Stubborn while in defenses, could not break them. 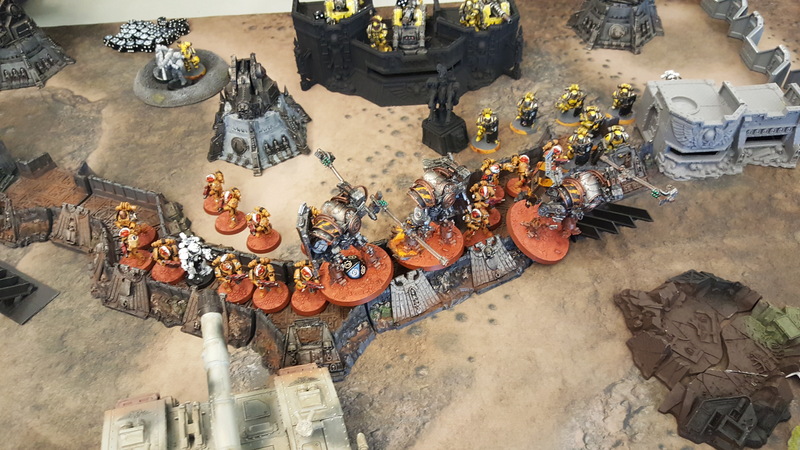 The terminators with Golg, not taking taking well to being thrown out of their vehicle, charge into the breacher squad right in front of them, wiping them out. 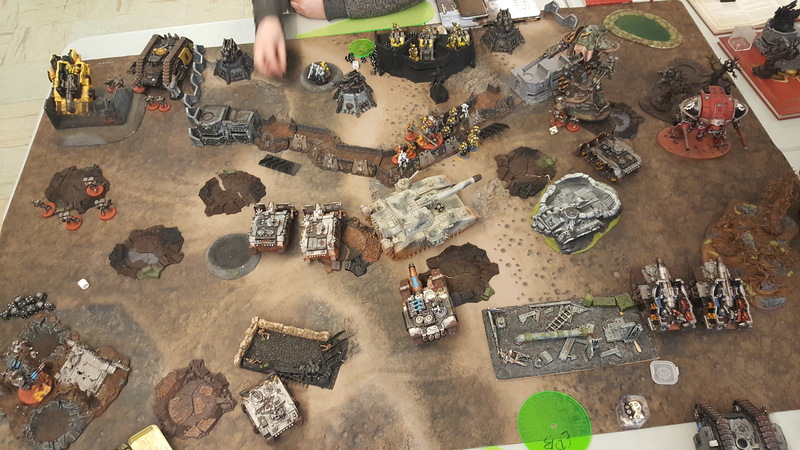 My support squad jumped out of their transport and wiped out the heavy vulkite squad sitting on top of their ruined bunker. 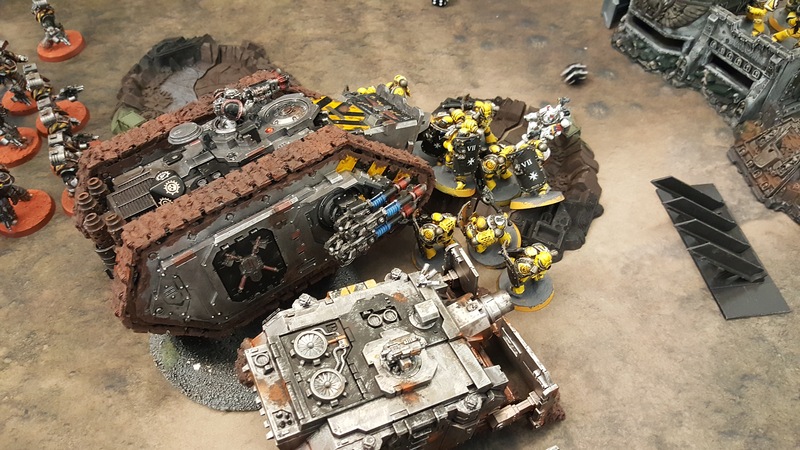 The Imperial Fists were able to bring in reinforcements, 2 medusa siege tanks, 2 knights, and a spartan full of terminators and Dorn himself. 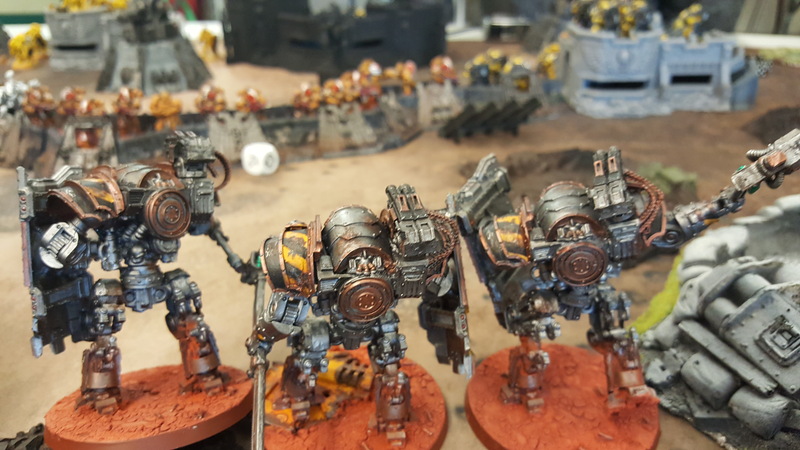 The knights came in together on the right flank, the others on the left . 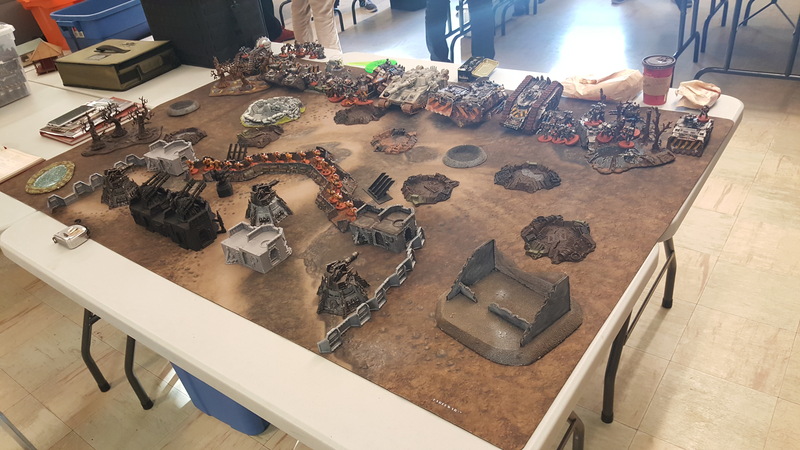 They were able to finish off my medusa and with a mighty load of ceramite melting fire, wiped out my support squad and turned them to dust. 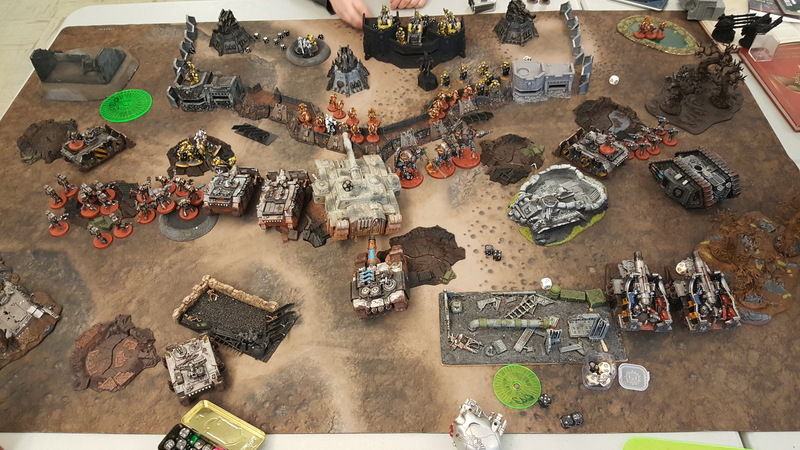 On the other flank the medusas and spartan opened up on my terminators who were now standing in the open and managed to whittle them down, as well as my tyrant terminators. 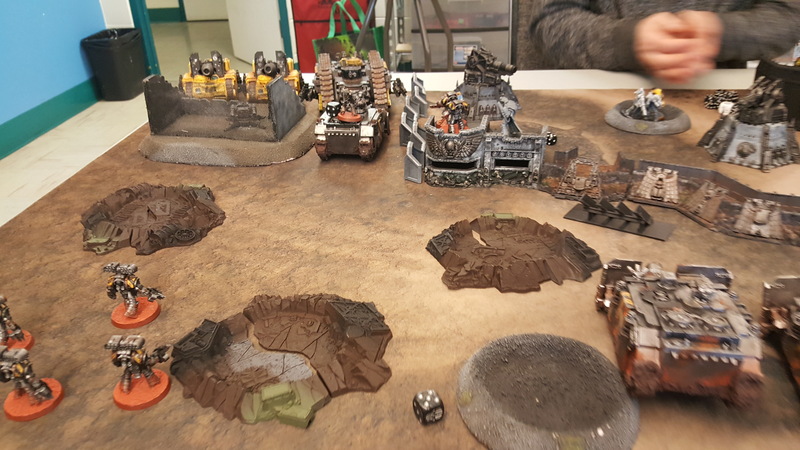 The second vindicator was also taken out by heavy weapon teams, and my iron havocs finished off by the automated turrets. 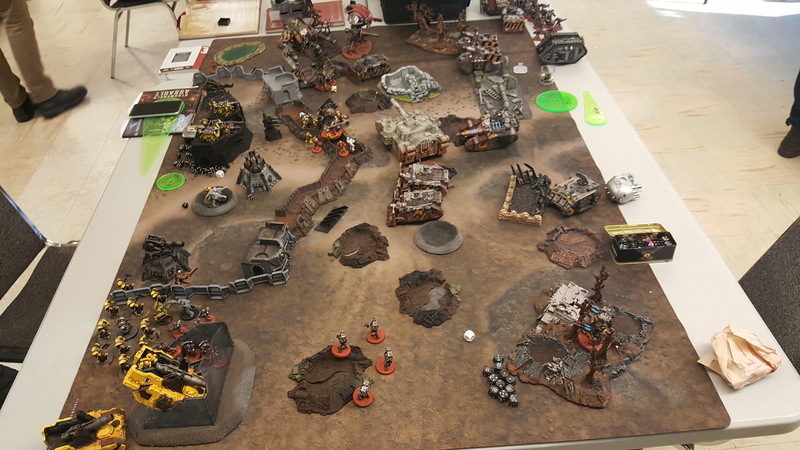 The final couple of turns saw the game slip away from the Iron Warriors as the reinforcements proved to be too much to stop (and some bad rolling didn’t help)! 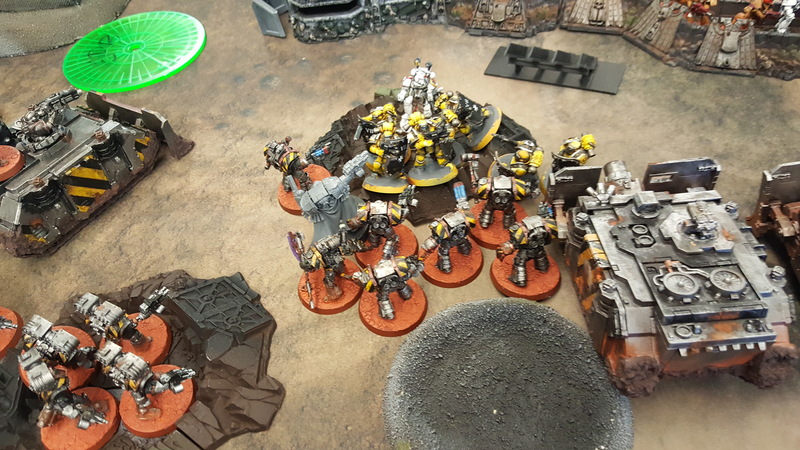 The rhino carrying 10 tacticals on the left flank pulled a cheeky charge right into the front of the enemy spartan, wedging it in place so that Dorn and his bodyguard had no space to disgorge. This would of course cost the rhino and its troop their lives…but it was worth it. Meanwhile Perturabo jumped out The Tormentor and joined with a nearby seeker squad. 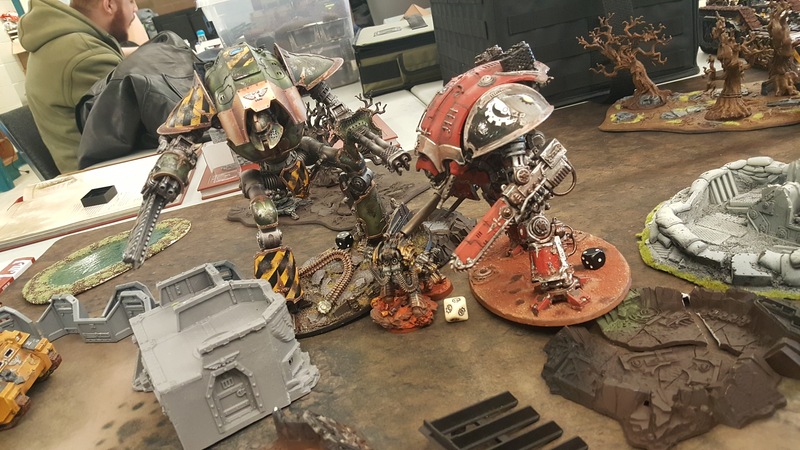 Together they charged headlong into the knight titans hoping to fell them quickly and avoid their stomps. He managed to strip the Cerastus of a few more hull points bringing it near death, avoiding its mighty attacks in return. 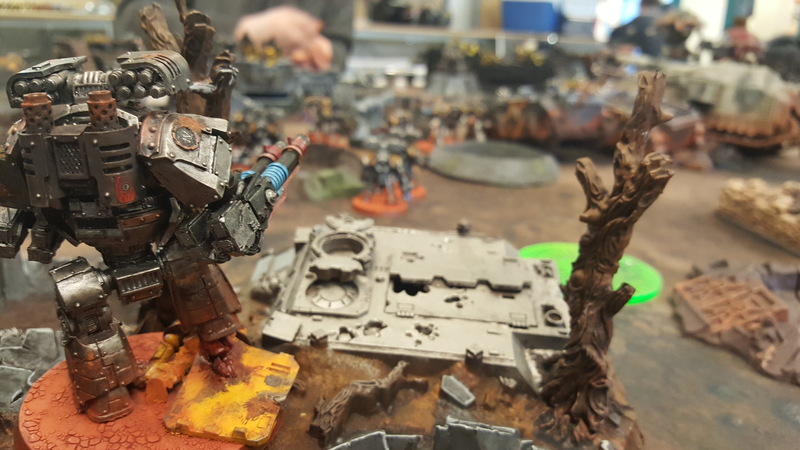 Golg was the only survivor of the spartan’s full terminator compliment and charged alone into the flank of the enemy spartan, ripping it to pieces with his chainfist. 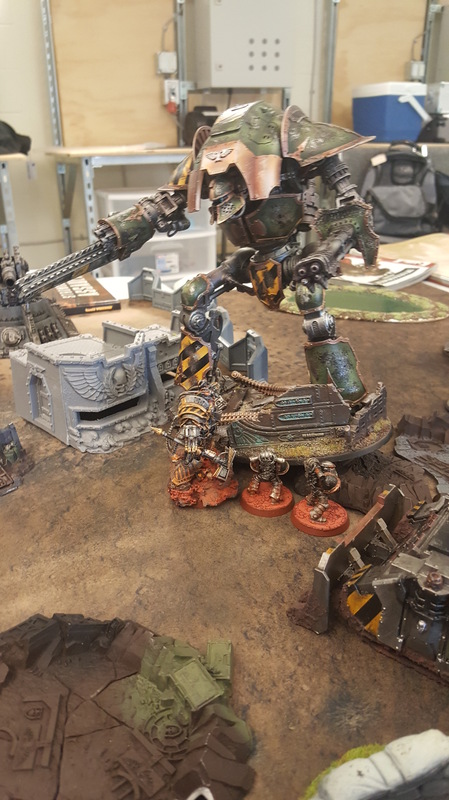 Dorn and his body were forced out, hatred burning in his eyes at this latest insult. 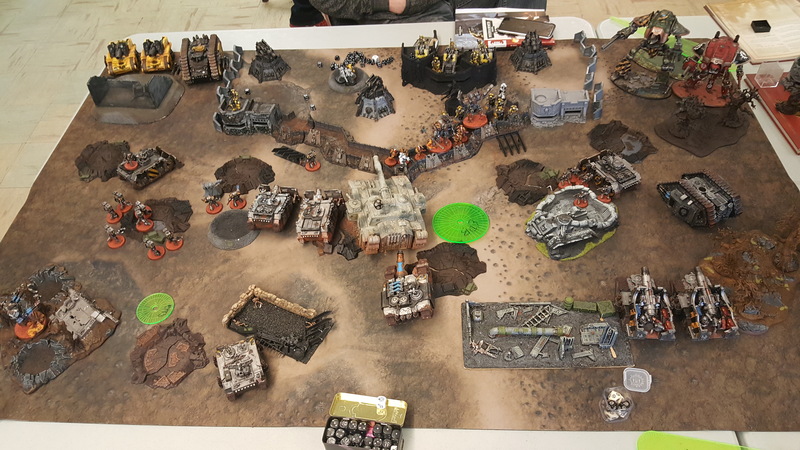 The Iron Circle spent the entire game engaged with the tacticals and then a breacher squad right in the middle, unable to break them as they stayed in their trenches. 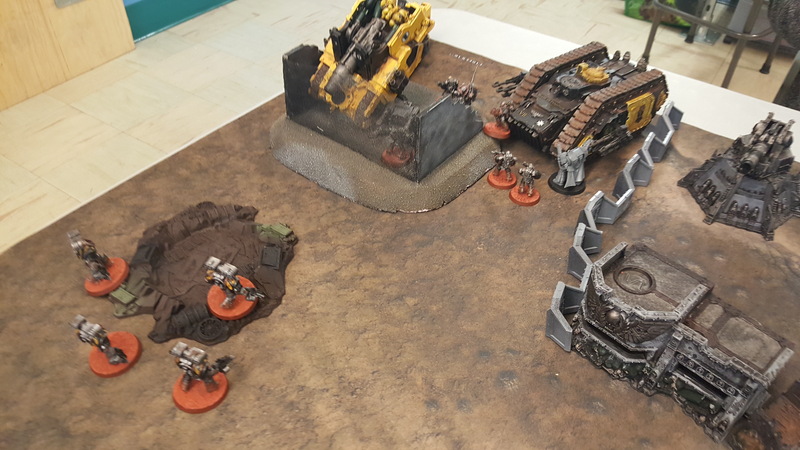 At the very end the last one was finally torn down by repeated powerfist attacks. There you have it! 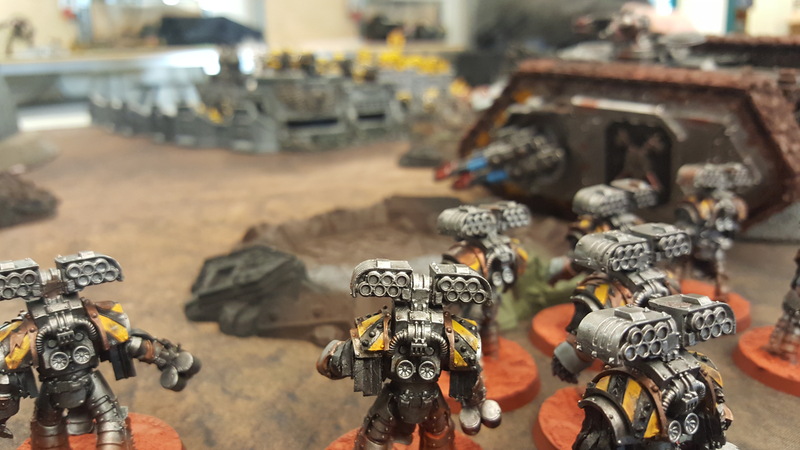 The campaign is over and the Imperial Fists managed to hold their ground and claim victory! 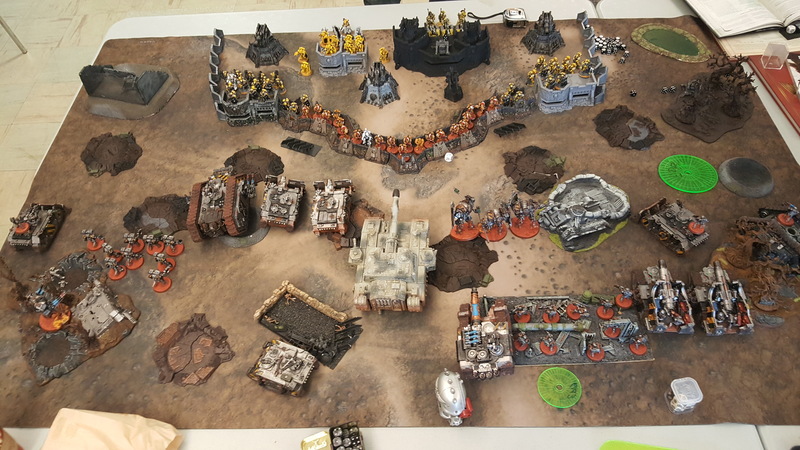 This was a very fun series of games, taking me into the largest solo 30k games (or any warhammer games) I have ever played! It was a challenge and I certainly made more than a few mistakes, but its all a good learning exercise. 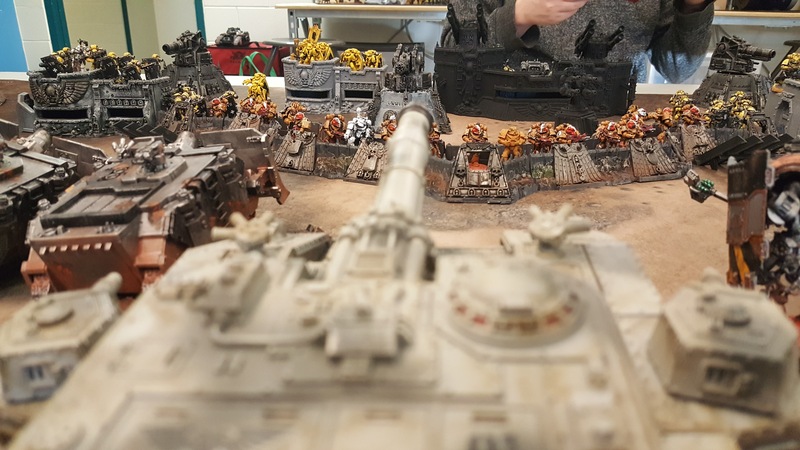 Hopefully we can do another campaign in the future…perhaps recreate the battle of Phall….